Relaxing in a hot tub is a great way to unwind after a long day of work. This also is something to do on a weekend with a group of friends or some family members. However, the cost to install these items is really expensive based on the model, the features, and other factors. 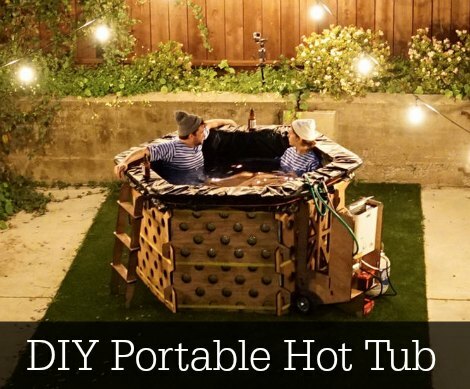 If you do not want have a bulky unit, then you may want to build a portable hot tub. The most important thing about a portable hot tub is an easy to assemble frame. A set of panels offers a great way to quickly assemble the unit anywhere space is available. There are many different options that can be used to build a frame for a portable hot tub. The material that is used is wood that you will need to measure and cut to assemble each panel. The best type of material to use for the frame is a marine plywood. This is resistant to rot and is a good option for outdoor use. You also will need a vinyl liner for the inside of your portable hot tub. You will need a liner that is durable as you do not want to have any leaks. Once you have the pieces of the frame built, then you can move on to providing a source of fuel used to heat the water for your portable hot tub. The best option is to use propane as it comes in small tanks.